Resonant cavities are key components in photonic circuits, providing feedback, wavelength selectivity, and energy storage to allow dispersion control and enhanced nonlinearity, resonant filtering, waveguiding with low bend radius and ultra-low threshold lasing. Silica microspheres and microcylinders with diameters ranging from a few microns to a hundred microns or more have been shown to exhibit high quality factors of order 109 when an appropriate whispering-gallery mode (WGM) is excited, and lend themselves to evanescent coupling to optical waveguides to provide integrated resonant functions in an optical circuit. In this project, in collaboration with colleagues in the Optoelectronics Research Centre in Southampton, we are studying ways to assemble sparse arrays of silica spheres onto planar waveguide structures to make a new generation of integrated optical devices. 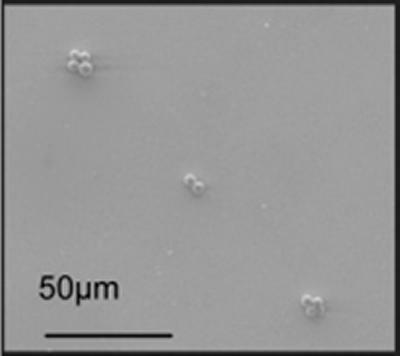 Our assembly strategy is to use dewetting phenomena to drive the deposition of glass spheres with diameter around 10 to 50 micron onto specific locations on a microfabricated planar surface using a combination of topological patterning and selective chemical modification of the surface to control wetting.